4x4, Unique Cast Aluminum Running Boards, Satellite Radio, iPod/MP3 Input, 17" Aluminum Wheels with Unique 33" BSW All-Terrain Tires, Fox Shox, 4.10 Electronic Locking Rear Axle with Hill Descent On/Off Switch, Selectshift 6 Speed Automatic Transmission, Trailer Tow Package with 4-pin and 7-pin Connection, Tilt/Telescoping Steering WheelSync Voice Activated Communication System, Privacy Glass, Keyless Entry, Child Safety Locks, Steering Wheel Controls, Raptor Graphics Package. 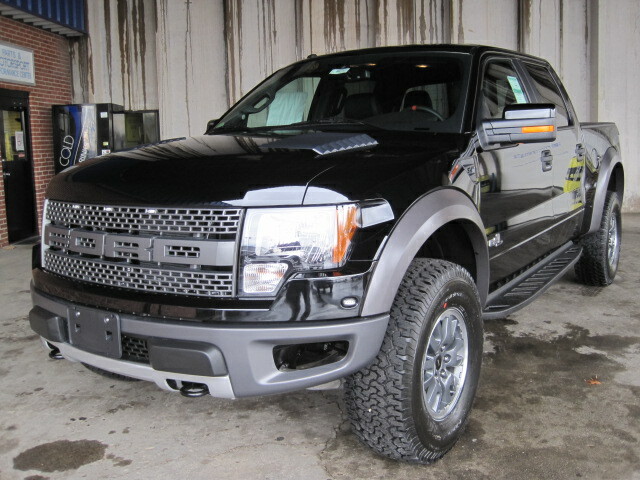 Raptor Luxury Package: heated 10-way pwr driver/front passenger seat w/driver memory, dual zone electronic automatic temp control (DEATC) air conditioning, AM/FM stereo w/Sony multi-disc in-dash CD & MP3 changer, body-color pwr folding pwr heated side mirrors w/turn signals/memory/drivers auto-dimming, Black/Unique Orange-Accent Leather Front Bucket Seating: orange-accent vinyl rear seat, orange-accent IP center stack & door panel applique finish, Power Moonroff, Raptor Plus Package: rearview camera, trailer brake controller, Graphics Package. 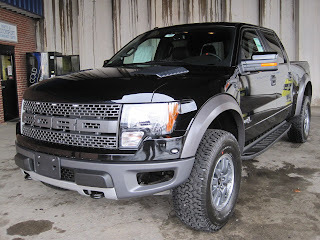 SVT Raptor with Black exterior and Black/Orange Leather Seats features a 8 Cylinder Engine with 411 HP at 5500 RPM*. 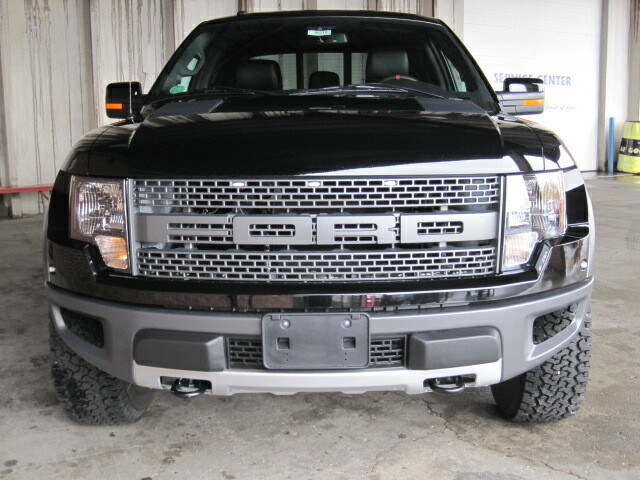 5.0L V8 Producing a mind blowing 444HP/380 lb.-ft of Torque. Ricaro Sport Cloth Racing Seats with Gray "Boss 302" embroidered logo. Born in '69. The Radar Gun Came Shortly After. For the first time in 42 years, a road racing legend returns. Why so long? Because we weren't going to do the Boss if we couldn't do it right. That meant creating an exterior that's every bit as lean and mean as its predecessor, and backing it with a 444 hp* beast under the hood. 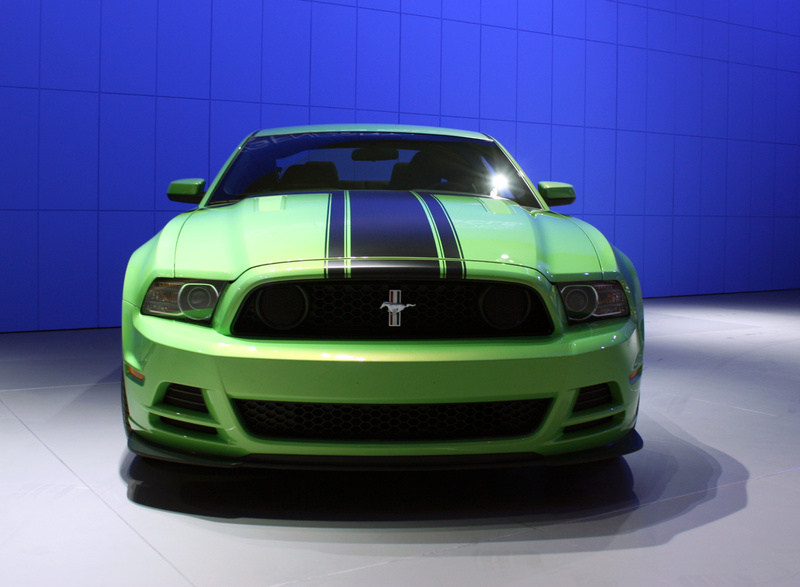 See how the Ford engineers prepared the 2012 Mustang Boss® 302 for the streets. 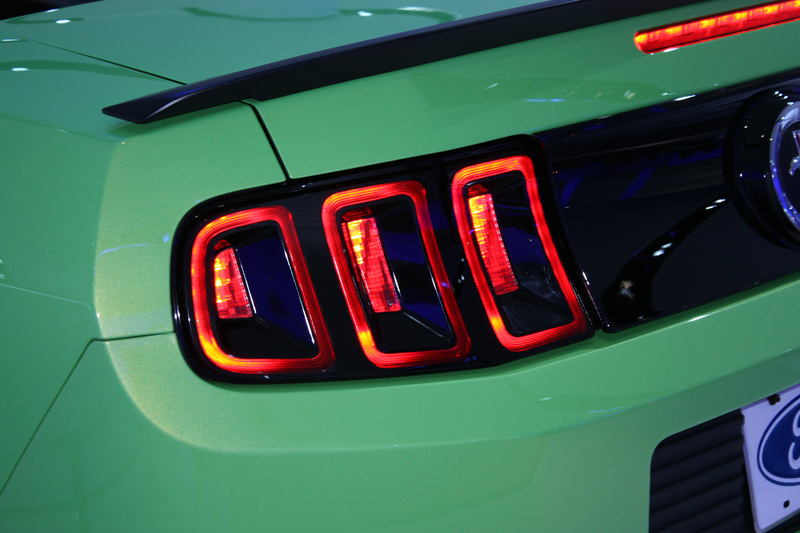 The 2012 Mustang Boss® 302 returns, and it's lean and mean, delivering more tail-kicking power than ever before. The 444 hp beast under the hood is all business. And when you get behind the wheel, you instantly feel the interaction between power, handling, braking and suspension. Its racing pedigree can be found everywhere and registers high on the list of every automotive adrenaline junkie's must-have machines. Mustangs have always been popular with Hollywood, and there may not be any other car in the world that has made as many big screen appearances as the Mustang. But some movies merely feature a Mustang; other movies put the American pony car front in center in the action, like “Gone in 60 Seconds,” both the original, and the remake. 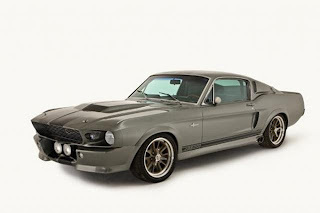 To that end, one of the original 1967 Eleanor Mustangs from the “Gone in 60 Seconds” remake will be heading to auction this weekend at the Autosport International Show, in Belgium. The car is being sold by by Coys auction house. We’re sure the arguments section will soon devolve into an argument over whether or not the remake was better than the original. Whatever your opinion, one cannot argue with the hotness of a blond Angelina Jolie stealing fast cars, nor the beauty of the “Eleanor” ‘67 Mustang. Since that movie debuted, Eleanor body kits have been all the rage among the well-to-do, and who can blame them? It’s a beautiful car, with a beautiful name. And it is now up for auction. There are a total of ten “Eleanor” Mustangs from the remake going up for auction, though this was one of just three designated as “hero” cars. This particular Eleanor was used for shots with actors, interior shots, action scenes, and so on. Originally powered by a 289, it now features a 331 Ford crate engine. Pre-auction estimates place the gavel-slamming price at between $115, and $155,000, which is probably only a little more than you could expect to pay if you went out and built one yourself. The question is…would you want it? While we here at Anderson Ford are big fans of the current Ford Mustang, we also know that there's something to be said about the iconic styling of its renditions of yesteryear. After all, the Mustang is a staple of automotive performance that drivers in the greater Clinton area and beyond just can't seem to get enough of. And that said, Ford has taken a big step in ensuring that those who opt to restore a classic Mustang to its former glory can do so safely and easily. More specifically, Ford recently invested in the development of new body shells that feature the exact fit, finish, and style of the original vehicle just off the assembly line. The Body shells are being manufactured to match the 1965, '67 and '69 models, and the American automaker is so confident in their quality that they've been officially licensed too. Dynacorn, the company behind these exciting new body components turned to the original convertible and fastback designs for reference when manufacturing them. However, it's worth noting that the company also worked to make the overall build much stronger than their inspiration. In fact, the body panels for the kit are even constructed from automotive-grade 'virgin' steel that's thicker than the original material used, welded with modern techniques that improve rigidity, and tested thoroughly to ensure maximum safety. 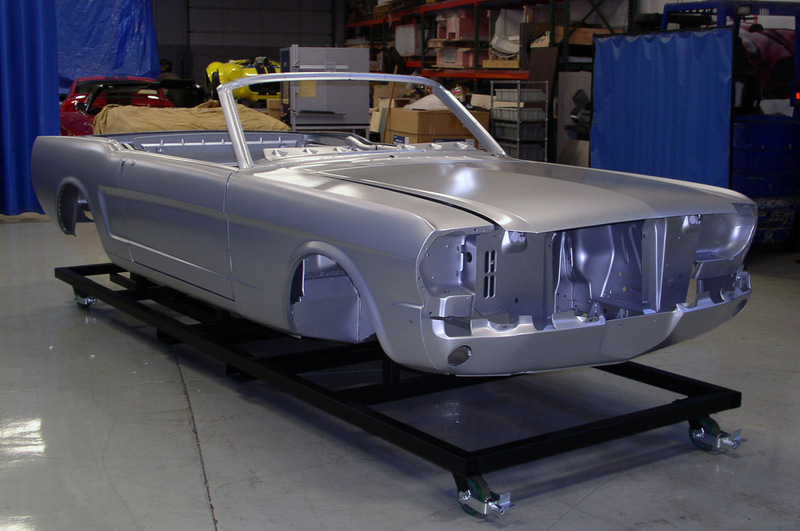 That said, we'd like to know... Will you be restoring an old-school Mustang any time soon? Or are you more interested in the latest generation of the performance-driven coupe? Either way, you can arrange a test drive on the Mustang or any other new Ford that we carry here at 1001 State Route 10 West, Clinton IL 61727 simply by contacting us online or by phone at (888) 715-6476. 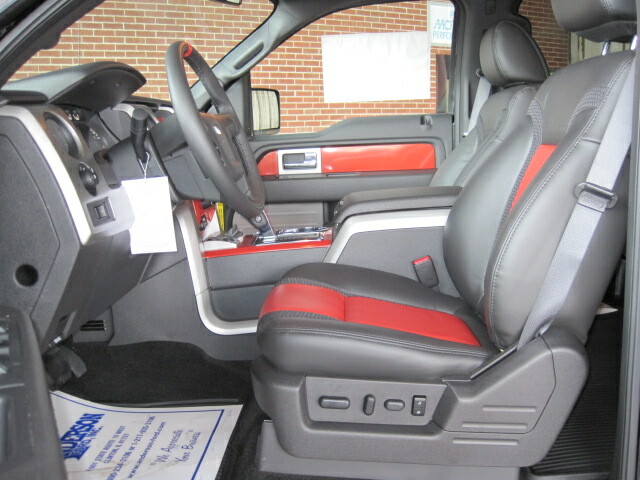 We're more than happy to answer any questions that you may have regarding models like the Ford Fiesta, Flex, and F-250. Furthermore, we can even shed a little light on some of the more tricky areas of choosing your next car. Unsure about your financing options? 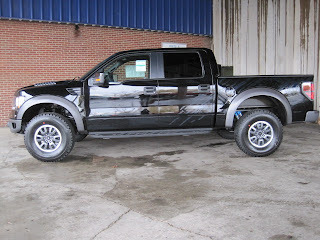 How about where to service your next Ford with genuine parts? We can demystify the whole car-buying and owning process when you pay us a visit, so make sure to do so soon! Those in drag racing and land speed circles are likely to know the name Brent Hajek, but for those who don’t, the farmer/oilfield service operator from Oklahoma seemingly has more full-size toys than most young boys have Hot Wheels cars, and even operates a motorsports museum in his hometown of Ames, Okla. 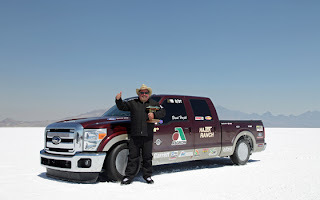 When he’s not busy making a name for himself as one of the nation’s top ranchers and spokespersons for corn-based ethanol fuels, he’s competing in the NHRA Super Stock division with his ’08 Cobra Jet Mustang or blazing across the salts of Bonneville in search of land speed record glory. Brent Hajek with his record setting 2011 Ford Super duty. And glory he attained last week during Bonneville’s annual Speed Week, held August 13th to 19th on the world famous Utah course and hosted by the Southern California Timing Association. Hajek, behind the wheel of modified 2011 Ford Super Duty, set three production truck land speed records during Speed Week, including the U/BD world record with a speed of 182.143 MPH in the truck that’s certainly not short on size or weight. On Speed Weeks’ third day, Hajek broke the existing three-mile record with a speed of 167.539 and following the customary impound, completed a successful backup run of 171.123 the following morning. The truck was then filled with B-20 Bio-Diesel and returned to the course, where it clocked the 182 MPH record-setting lap down the salt. BIRMINGHAM, 12 January 2012 – The all-new Ford Fiesta RS World Rally Car livery was revealed today when the company's official team unveiled the new colors that will adorn the car in the 2012 FIA World Rally Championship. Ford World Rally Team director Malcolm Wilson and Ford of Europe motorsport chief Gerard Quinn unveiled the livery for the eye-catching Fiesta RS WRC at the Autosport International Racing Car Show in Birmingham, motorsport's traditional start-of-season showcase event. The team will continue to be sponsored by Castrol EDGE. Branding for Castrol's global range of best-in-class motor oils will feature prominently in the Fiesta RS WRC's new livery for the upcoming season, as it did in 2011. The Fiesta RS World Rally Car, with its four wheel-drive transmission and 1.6-litre EcoBoost-inspired engine will once again spearhead Ford's challenge in the 2012 and 2013 championships. The car, based on the best-selling Fiesta road car, claimed a clean sweep of the podium in both the first and final rounds of its debut season last year. Finland's Jari-Matti Latvala and co-driver Miikka Anttila, who topped the world rankings for special stage victories in 2011 and won the final round of the championship in Rally GB last season, are confirmed as team leaders for 2012. They will be partnered by former world champion Petter Solberg and Chris Patterson, who have signed a one-year agreement to drive the team's second Fiesta RS WRC in all 13 rounds. The experienced Solberg won the world title in 2003 and the 37-year-old Norwegian has 13 world rally wins to his name. It will be his second stint with Ford, having launched his world rally career with the team in 1999. "Both Castrol and Ford have a long standing association with motorsport and have shared great past successes in rallying, a second placed finish in both the drivers' and manufacturers' championships in 2011 being the most recent highlight. The WRC is motorsport's toughest competition for production-based cars, together we will continue to be able to call upon our vast experiences of developing, testing and optimizing the combination of car and engine oil technologies in order to push boundaries and maximize performances. "The strength of Castrol EDGE, helps to ensure maximum engine performance, and will help give Jari-Matti and Petter the freedom to demand that performance again and again, hundreds of times in a stage." "We have a great partnership with M-Sport and its leader, Malcolm Wilson, and great technical partners in Castrol. Our strong driver line-up includes Jari-Matti Latvala, recognized as one of motorsport's rising stars. Already regarded by many as the fastest driver in WRC, during 2011 he showed consistency and expertise on all surfaces. We believe he will flourish in his new role as team leader with the Ford World Rally Team, and look forward to seeing his pace light up the special stages around the world. "The addition of Petter Solberg to the team brings one of the sport's most experienced and flamboyant drivers back to the team where he started his top-level career. A drivers' world title in 2003 and 13 world rally victories are testament to his abilities and his vast experience will be a great asset to our driver line-up." 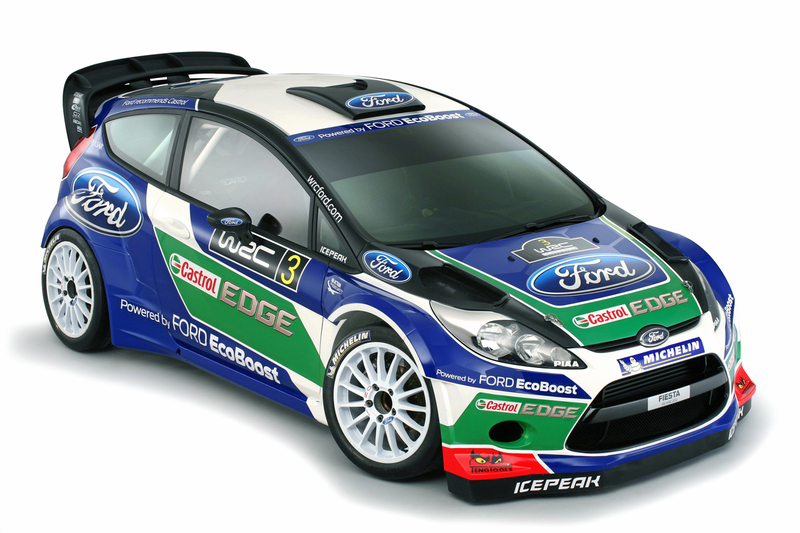 "It's great to have Ford onboard as manufacturers again this season and you can see from the new livery how important Castrol EDGE will be again in 2012 as a technical partner. After such a strong performance last year we are really excited about where we can be at the end of the season. With the car and driving team we have, alongside the experience and expertise of our employees at Dovenby Hall, and our partners, I am confident we can challenge for world titles." Among the new color choices is the 2013 'Gotta Have It Green', photographed here in at Ford's Detroit Auto Show under way this week. We like the new reflective 'hockey stick' side graphic that replaces the boomerang U-shaped treatment of the 2012 model. If you don't (like) Gotta Have It, there's also a new Impact Blue paint choice, along with School Bus Yellow and last year's Black, Ingot Silver, Race Red and Performance White.